The riots near the Gaza Strip border had nothing to do with the opening of the US Embassy in Jerusalem, as they were planned as part of the Great March of Return launched on March 30 over the 70th anniversary of what the Palestinians call Nabka ("catastrophe") — the foundation of the Israeli state, Jerusalem-based political analyst and publicist Avigdor Eskin argues, outlining the destructive role of the Hamas militant movement during the unrest. On May 14 — the day of the opening ceremony — a number of Western mainstream media sources, including The Guardian, CNBC, Business Insider and The Wall Street Journal, called the border unrest Jerusalem embassy protests. "I saw the media reports about 'Palestinian protests' in Gaza against the US move and the excessive use of power on our side," Eskin told Sputnik. "But the news broadcasters failed to report that the Hamas movement did not protest at all against the relocation of the US Embassy. One who reads English or Arabic could have checked what Hamas itself said. They issued a press release before the riots. Please, read it carefully." The publicist has called attention to the fact that Hamas's statement doesn't even mention the May 14 relocation of the US Embassy to Jerusalem. "The new young generation never forgot the horrors that their grandparents experienced during 1948 and they are still fresh in their memory. 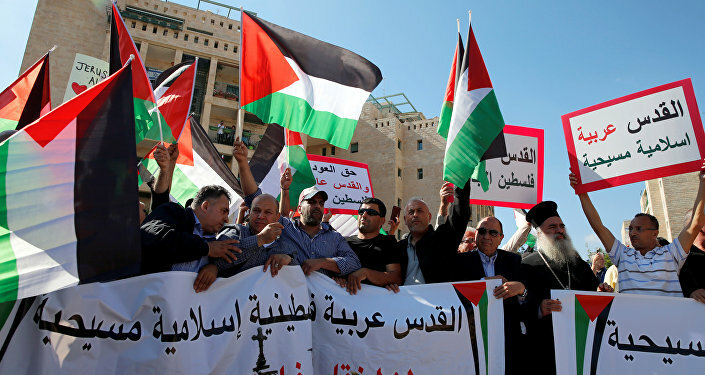 They have stood firm against any efforts that aimed to uproot the indigenous people of Palestine from their homeland," the May 13 statement said, stressing that Hamas "reject[s] all forms of normalization with the Israeli Occupation." According to Hamas, Palestinians have the right to return to territories, which, according to them, were illegally seized by Israel in 1948, as well as during the Six Day War of 1967, while the Israeli government stipulates that Palestinians can settle only in Gaza and the West Bank. The Israeli analyst bemoaned the fact that the mainstream media had largely neglected the facts of what he called a "massive and well planned attempt to break through [the Israeli] border in order to kill and take hostages." "I did not see any report on the fact that there were thousands of tires burnt in order to give a cover for an invasion," Eskin noted. "There are many more details which were simply ignored by the media. The Israeli Defense Forces (IDF) did an excellent job there. They were stopped from breaking in. And the next day there were almost no riots at all." The analyst presumed that this episode could be compared with the Sino-Soviet border conflict in 1969 near Damansky (Zhenbao) Island or border clashes between Mexican illegal migrants and US border forces. When asked whether the US Embassy transfer and violent clashes on the Gaza Strip border could prompt sympathy with Hamas among Arab state and non-state actors, the Israeli publicist said that the Palestinian militant organization enjoys no support from the Arab countries. "Their main sponsor Qatar backed off," Eskin remarked, referring to the continuous blockade imposed on the Gulf monarchy by its neighbors, most notably Saudi Arabia, in June over its reported ties with the Muslim Brotherhood and its offshoot Hamas, among other issues. Meanwhile, the question arises as to how the official recognition of Jerusalem as Israel's capital by the US could affect the relationship between Israel and Saudi Arabia. The two have seemed to team up in the face of Iran's rise in the region despite the fact that they have yet to establish official diplomatic ties. Previously, Saudi Crown Prince Mohammad bin Salman opined that the Israelis "have the right to have their own land" along with the Palestinians while speaking to Jeffrey Goldberg of The Atlantic, which prompted some analysts to presume the existence of an unofficial alliance between the two countries. However, in response to the relocation of the US Embassy to Jerusalem, Riyadh stated Tuesday that it "rejects" Washington's decision. "This step represents a significant prejudice against the rights of the Palestinian people which have been guaranteed by international resolutions," the Saudi Council of Ministers said, as quoted by the Saudi Gazette. Still, Eskin argues that "the relocation of the US Embassy will only improve the relations between Israel and the Arab world" in the future. "President Trump is absolutely realistic when he speaks about growing chances for peace and cooperation as the result of his policies," the Israeli publicist said. 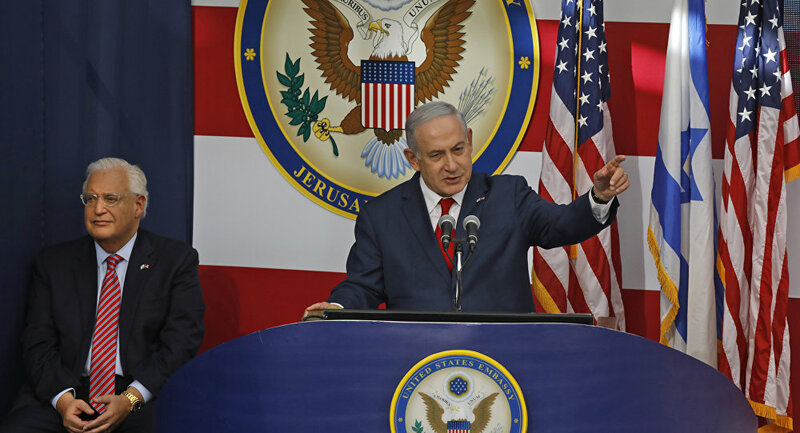 "The US is a major player in the Middle East and Trump showed his Arab allies that Israel is an indispensable ally and no attempts to undermine the right of Israel to exist will be tolerated. The message is clear. You will see now a steady improvement in the ties between Israel and the Arab world on a practical level, while you will always find that there is no place for Israel in the minds of their [Arab] theologians." Neither will the US Embassy transfer undermine Washington's relations with its Middle Eastern allies, according to the analyst. Reiterating his remarks made during the December interview with Sputnik, Eskin opined that the recognition of Jerusalem by the US "will contribute to peace and stability." According to the analyst, one could witness a decline in terrorist activities in Israel since Trump announced the US Embassy transfer in December 2017 and "the riots near the border had nothing to do with the issue of the embassy as you can see firsthand from the rioters themselves." Meanwhile, Trump's initiative has prompted polarized responses worldwide. Earlier, Moscow voiced its concerns regarding the relocation of the embassy, stressing that it could contribute to an escalation of tensions in the region. On May 16, Russian Foreign Ministry spokeswoman Maria Zakharova highlighted that "Moscow is extremely concerned about this dangerous escalation" and expressed "sincere condolences to the families and friends of the Palestinians killed, wishes for a speedy recovery of the victims." For its part, Turkey called upon Muslim countries to reconsider their ties with Israel in light of the recent border clashes in Gaza, dubbing them "genocide." The Palestinian Health Ministry reported that the border clashes resulted in more than 2,500 Palestinians being wounded and 59 killed, adding that since March 30, 104 Palestinians have been killed and over 12,000 others injured by the Israeli forces. The views and opinions expressed by Avigdor Eskin, Ekaterina Blinova are those of the contributors and do not necessarily reflect those of Sputnik.